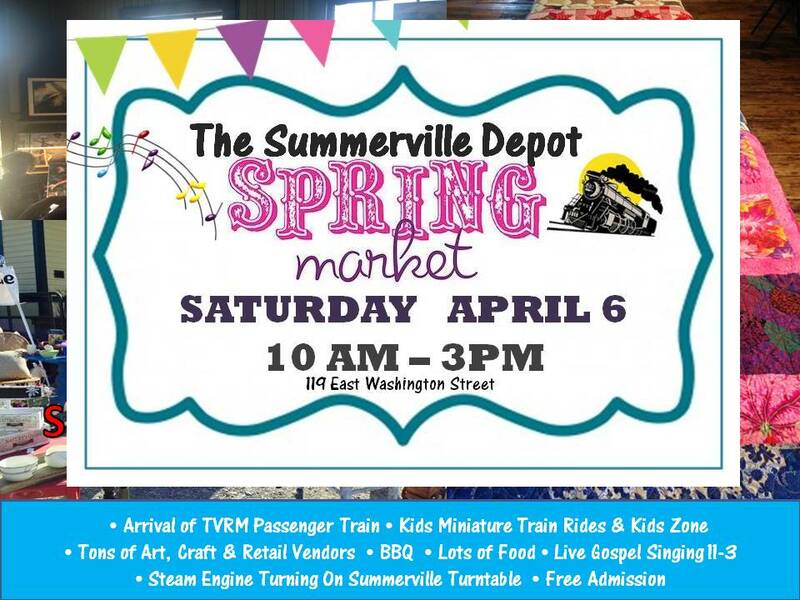 Saturday, April 6, 10AM-3PM, The Summerville Depot, 119 East Washington Street. Come celebrate the arrival of spring at the Annual Spring Market At The Depot in downtown Summerville, GA. Tons of vendors will be on site with a wide variety of merchandise and goods. Enjoy a live Gospel Singing from 11-3 and a scheduled 1 PM arrival of the Tennessee Valley Railroad Museum Passenger Train. The Summerville Turntable is always a big hit for train fans, as it turns the majestic steam engine,following the train arrival. A miniature train will be boarding at the depot, offering rides to young and young at heart throughout the day. There will also be a "Kids Zone" with inflatables. Specialty, retail, craft, and food vendors from Georgia, Tennessee, and Alabama will be on hand.